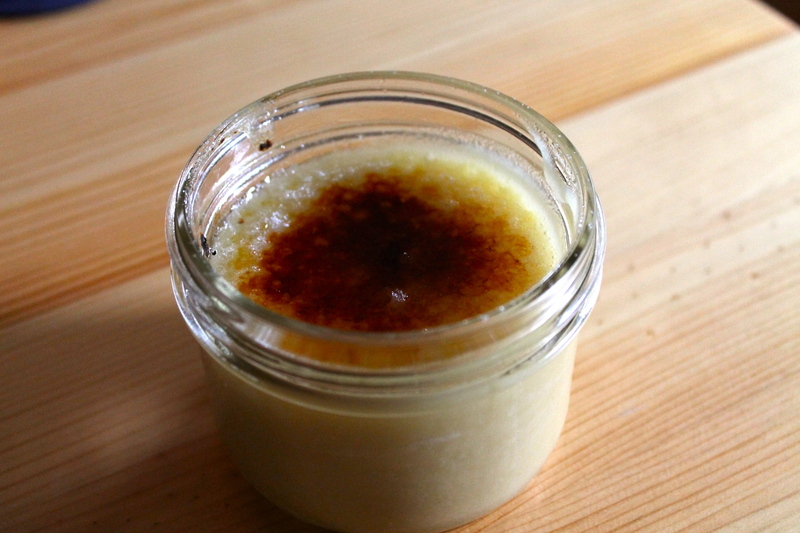 If there was ever a dish that was NOT vegan, crème brûlée is probably it. Full of delicious, full-fat whipping cream and egg yolks, the joy of cracking into a crème brûlée is the creamy, dreamy custard underneath. 95% of the recipe is milk or eggs. So–how to create that same texture using non-dairy ingredients an no eggs? Big challenge. Enter Mérida Anderson. She became a vegan when she was 16. Her family did not convert. She had no choice but to learn to cook for herself, because her mom basically forced her to. She has no formal training as a chef, but five years ago was on a bike tour in Easter Canada, and ended up in Halifax. She got invited to a secret vegan supper there. This new trend, much like Diner En Blanc, uses people’s homes to create a kind of pop-up restaurant for one night. Mérida came home and started one on Sunday nights, once a month, in her tiny East Van apartment. Recently, a collection of her recipes has been published. Vegan Secret Supper is not for the beginning cook. Anderson’s recipes are complex but beautiful, each one often requires 2-3 recipes to create the finished dish. But this is elevated vegan food. The one recipe that people wanted the most? Vegan crème brûlée. I made this for a small dinner I went to the other night. The reviews were a bit mixed. Taste-wise, it was a huge hit. It’s delicious. There is a slight hit of acid from the lime, that plays very nicely with the vanilla. But texture-wise, it didn’t have quite the same creamy mouth-feel as a regular crème brûlée. It was a little soupy. Part of the problem with the version I made may have been my coconut milk. When I opened the can and dumped it into the food processor, it was badly separated, and there was a lot of coconut water. I might substitute coconut cream for the coconut milk called for, or leave the can in the fridge for a few hours and pour off the coconut water and just use the solid coconut milk. I’m not sure if this recipe is good enough to make me give up traditional crème brûlée. But I do know that if I were 100% vegan, I would love, love LOVE it. One last note: you will require a torch for this particular brûlée. With traditional crème brûlée that’s baked in a bain marie, you can maybe get away with using your broiler. But because this is not cooked, you just can’t. For more information about Vegan Secret Suppers, visit their website. Wrap sweet potatoes in foil and place on a baking sheet. Bake for about 45 minutes to an hour in a 375-degree oven, or until soft. Unwrap, and allow to cool. Peel. I put mine through a potato ricer, just to get an even finer texture. You need 2 cups of cooked, sweet potato flesh. In a food processor or blender, add the sweet potatoes, coconut, lime juice and zest, vanilla and maple syrup. Blend until smooth. Spoon into ramekins, and put in the fridge to set, 6 hours, or overnight. 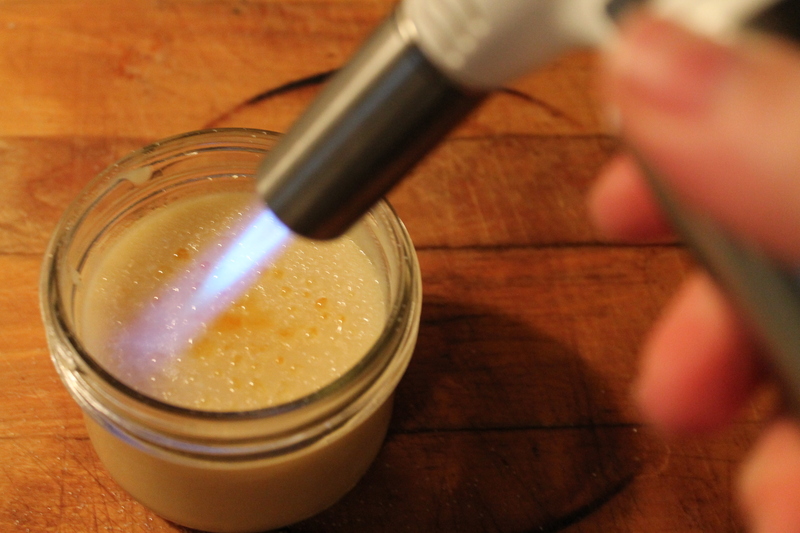 When ready to serve, sprinkle a thin layer of sugar over the surface of the pudding, and brulee with a torch until the sugar is hard and caramelized. Check out my recipes for traditional crème brûlée, chai crème brûlée, and Chocolate-coconut (dairy-free) crème brûlée as well. I love mine! But it was a gift…. Maybe go to Home Depot and buy one of those butane jobbies–that’s what the pros use, anyway!